Want to give someone special a portrait of their beloved pet as a gift, but don't have any photos of the pet? Want to avoid the akwardness of asking for photos of their pet? 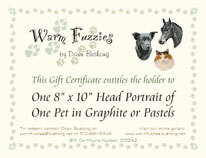 A Warm Fuzzies Pet Portraits Gift Certificate is the answer for you! By Type - This option allows you to select a specific type of portrait to give (for instance One Pet, Head Only, 11"x 14", in Pastels), which will still allow you to keep the monetary amount a surprise from the recipient. By Value - This option allows you to select the specific amount to give for the portrait, which lets the recipient to pick any combination of size and number of pets they like within the constraints of the certificate amount. Gift certificates can be delivered to you via e-mail for you to print out yourself, or via regular postal mail, already printed for you and ready to be given. Please fill out the form below, and I will send you your gift certificate after receipt of payment. All fields are required unless otherwise specified. Note: The 8" x 10" size is big enough for one pet, head only.